In the summer there are some nice camp spots along Cache Creek and the Yolo County campgrounds are also a mecca for creek fans. If you decide to check out the creek at any other time of year and you don’t want to brave the weather in your tent, head west to Clear Lake for accommodations or east to Cache Creek Casino in Woodland along Route 16. These are a few of the many hotel, B&B and campground options available. Cache Creek Canyon Regional Park Yolo County Park system. (530) 666- 8115. One hour north east of Woodland off of Hwy 16. Features many campsites, a playground made from recycled materials and seventy acres for hiking, biking, fishing and horseback riding. A popular destination for rafters and kayakers because the campground also has river access. Edgewater Resort and RV Park 6420 Soda Bay Road, Kelseyville, CA 95451 (707) 279-0208. Reservations 800/396-6224. 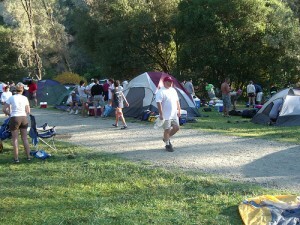 RV, tent camping and seven cabins available. Also One house can sleep 8 to 12 people. Full RV hookups. lakefront camping, beach access, swimming pool, fishing pier, boat launch laundry and showers. Pets welcome. Pine Acre Blue Lake Resort 5328 Blue Lakes Rd, Upper Lake, CA 95485 (707) 275-2811. Five rooms, Five cottages with kitchenette, 1 deluxe suite with fireplace in living room, full hookup RV sites and tent camping sites, showers, wireless internet, store, fishing pier, beach access, small boat, row, pedal boats and kayak rentals. Open all year. If you want a posh, but adventurous weekend away, spend the day rafting and then head to a charming B&B for a good night of rest and relaxation. The area surrounding Cache Creek has many quaint, but upscale places to stay. Wilbur Hot Springs (916) 473-2306 An hour drive north on Hwy 16 from Bear Creek. Natural mineral hot springs, message, guests are free to cook in the open kitchen. Rooms with European style bathrooms, camping. One studio with full kitchen, private bath. Turn of the century B&B. Call to reserve a room. This casino has been around since 1985 but newer additions like the 200 room hotel and spa, many restaurants and entertainment venue as well as over 3,000 slot machines and 142 table games, including a 28 table Poker Room ma a prime destination inke it the area. Tallman Hotel 9550 Main Street, Upper Lake, CA 95485 (707) 275-2244, Reservations suggested. A charming restored 1890’s Victorian hotel with 17 rooms to choose from. Garden suites feature private balconies or garden patios and Japanese soaking tubs to take he whitewater chill off. All rooms have Internet access, air conditioning, TV with cable/satellite and a DVD/CD player. Pets allowed in certain designated rooms. Open year round. Giraffic Park 12431 Laurel Way, Clearlake Oaks, CA 95423 (707) 998-1625. Despite the unusual name this one bedroom home makes for a nice weekend getaway retreat. Pets allowed. Within walking distance to many eateries, grocery store and wine tasting. Check out the website to see the laundry list of amenities including an outdoor shower and fire pit and two person hammock to relax under the stars after your day on the creek. Two night stay minimum. Arbor House Inn 150 Clear Lake Ave Lakeport, Ca 95453 (707) 263-6444 Located in downtown Lakeport, this renovated B&B has five guest rooms with whirlpool tubs and internet access. B&B perk:A three-course breakfast is included or you can upgrade to a full champagne breakfast for $15.